Echinacea is a wildflower native to North America. While echinacea continues to grow and is harvested from the wild, the majority used for herbal supplements comes from cultivated plants. The root and/or the above-ground part of the plant during the flowering growth phase are used in herbal medicine. At the first sign of a cold, taking immune-stimulating echinacea as a juice or tincture may make colds less severe. Studies have found that echinacea stimulates the function of a variety of immune cells, particularly natural killer cells. Taking it appears to speed recovery from the common cold. Taking echinacea may help clear flu symptoms faster. The antiviral, immune-enhancing, and wound-healing properties of echinacea may make this herb a reasonable choice for canker sores. In traditional herbal medicine, tinctures of various herbs including echinacea have been applied topically to herpes outbreaks in order to promote healing. Echinacea provides anti-inflammatory and antimicrobial actions critical to successfully treating gingivitis. Supplementing with echinacea may increase immune activity against HIV. Echinacea is used among European practitioners of herbal medicine to promote wound healing. 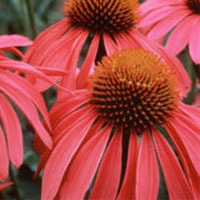 Echinacea, which enhances immune function, has been used successfully to treat yeast infections. Echinacea was used by Native Americans for a variety of conditions, including venomous bites and other external wounds. It was introduced into U.S. medical practice in 1887 and was touted for use in conditions ranging from colds to syphilis. Modern research started in the 1930s in Germany.